Timber Harvesting’s May/June issue spotlights young Arkansas logger Kevin Jester, who has adjusted to mill cutbacks/closures, sweeping changes in forestland ownership and ballooning operating costs to keep his trucks rolling. A positive attitude and a crack crew of mostly younger guys help fuel his confidence in the future of the logging sector. 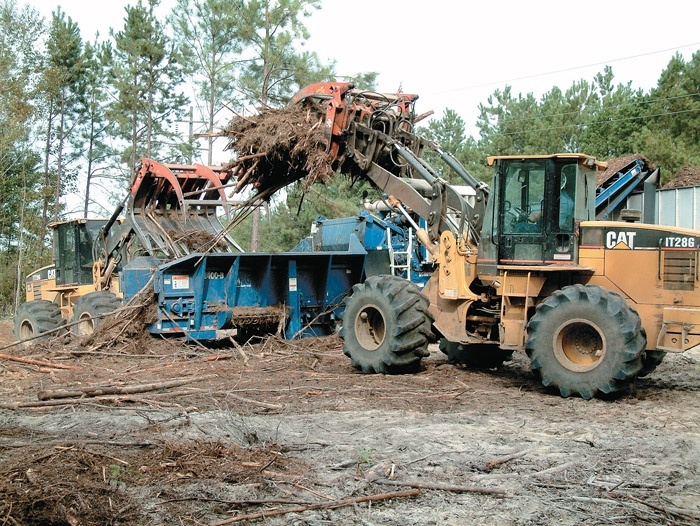 Also featured are the Pennsylvania operation RRD Land Clearing, which has seen a growth in mulch markets even during the housing slump, and Florida’s father and son team Conner and Conner, which has a keen perspective on the industry. 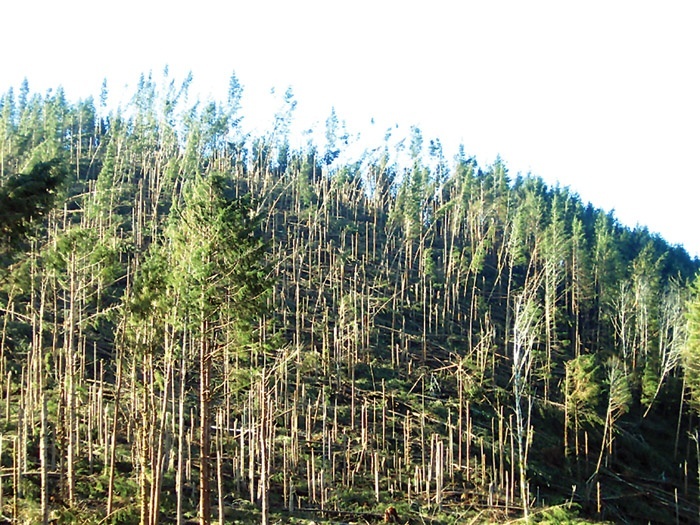 Articles highlight topics such as the Northwest loggers’ efforts to harvest timber damaged during major December windstorms and insight from Canadian researchers on handling biomass. The Roundup section features bunchers, with a primer on today’s advanced machines and attachments. 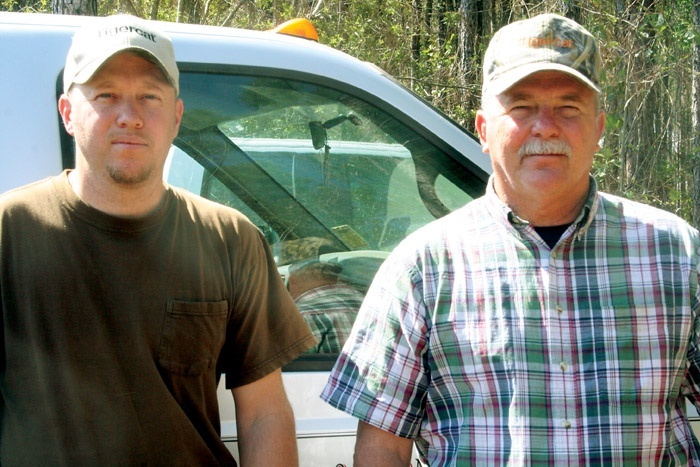 Butch Diller and his brother-in-law, Robert Derrickson, both 51, are the owners of RRD Land Clearing here. Diller oversees field operations while Derrickson handles the business and accounting side. 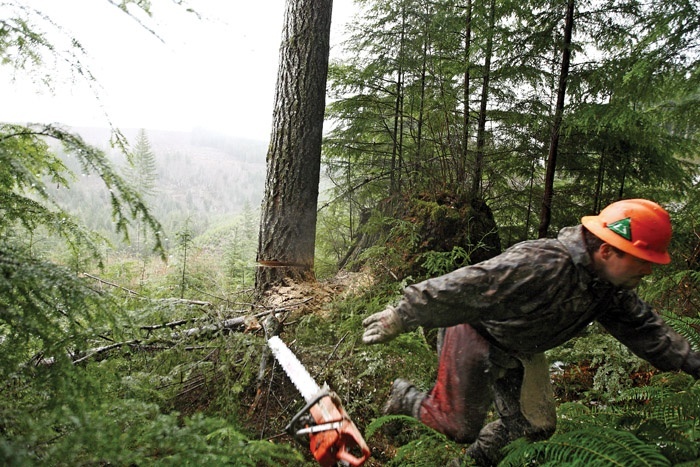 Northwest loggers are still working in many areas to harvest timber damaged during major December windstorms that affected more than half a billion board feet in a concentrated area in northwest Oregon and southwest Washington. If Mark Ryans and Luc Desrochers could get one message across to folks entering the forest biomass recovery business, it’d be to integrate this new task into the rest of the forest value chain. The March-April issue of TH pointed readers to a web poll that sought opinions on the TV series ‘Ax Men.’ More than 80 subscribers had responded as of April 17. Norval Conner, 60, and his son Jamie, 37, share more in common than their surname. 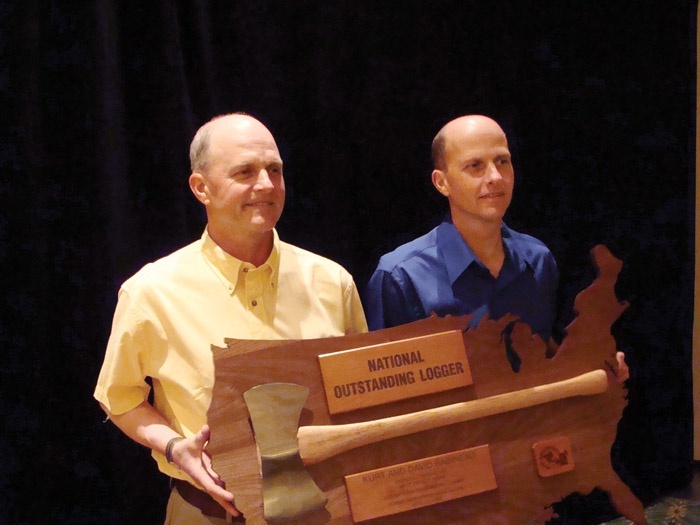 Though they represent different generations of loggers, both love working in the woods, and both have enough experience to share similar perspectives on the state of the industry. 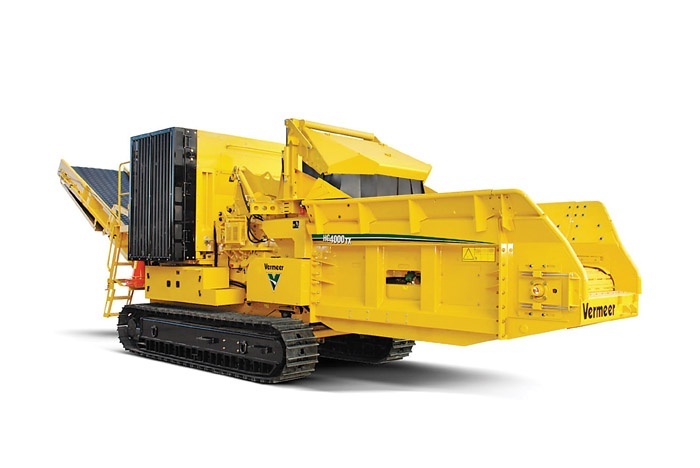 Caterpillar track and wheel feller-bunchers are built with proven Cat components and supported through the corporation’s international dealer network. 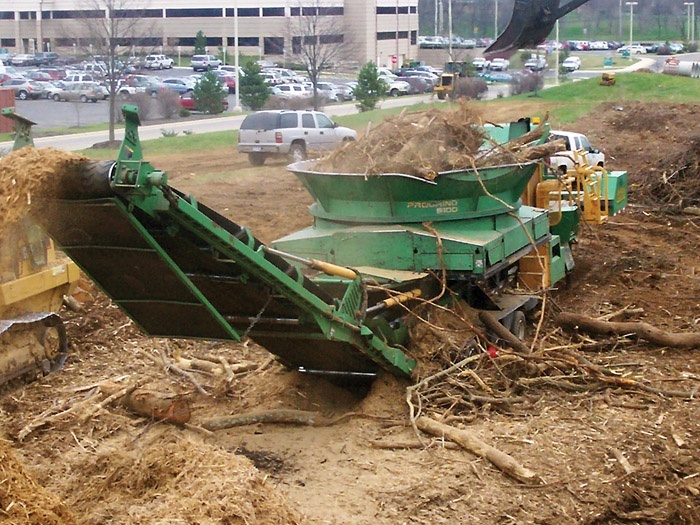 Catalyst Paper, Vancouver, BC, reportedly can no longer get enough wood chips to keep all its coastal pulp and paper mills running, singling out fiber shortages as a key factor in the company’s poor performance in the first quarter. Soaring fuel prices have just about everybody wringing hands these days. 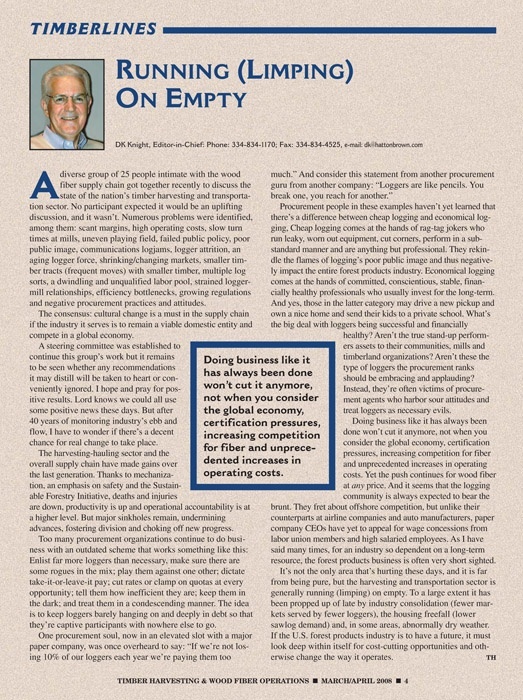 Consumers and businesses struggle with the burden while oil companies ring up record profits. Chairman & CEO Bob Smith of Precision Husky stated that in 2007 for the first time in the history of the company an international customer purchased the most equipment from the Alabama-based company. 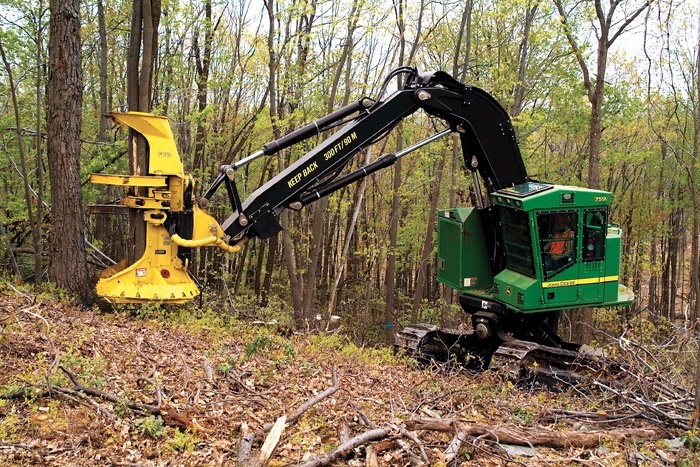 The Vermeer HG4000TX self-propelled horizontal grinder allows the operator to effectively maneuver around landclearing, compost or forest thinning jobs without the need for additional support equipment. Forest Resources Assn. 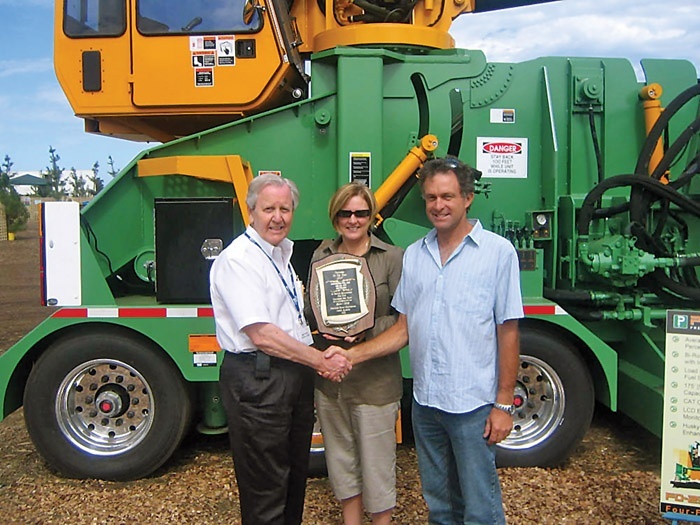 named Babineau Logging, Inc. of West Enfield, Me.—owned by David and Kurt Babineau—as its 2008 National Outstanding Logger at its April 13 Annual Awards Luncheon in Myrtle Beach, SC.